It is a pleasure for me to be part of this Sarangi website team and to cite Khausrau’s couplet in introducing this small effort, which hopes to demonstrate that both the sarangi and vocal forms of Indian Classical music are not only alive and thriving, but via the medium of the internet, stand ready to achieve a fresh global resonance. The following few paragraphs, outline the nature of my association with North Indian Classical Music and pay a humble tribute to my brilliant teachers, wonderful friends and loving family. I was born on May 28, 1975 in Abbotabad, Pakistan, some 40 miles from the banks of the river Indus. I currently reside in the twin cities of Rawalpindi and Islamabad, at the first foothills of the Himalayan/Korakorum/Hindukush mountain range. 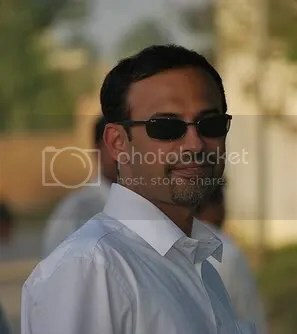 I completed my Masters in Finance from the London School of Economics and Political Science in 1999 and currently work for an investment banking firm in Islamabad. I have been a student of music since my O’ levels days at Saint Mary’s Academy, along with my three most talented classmates Dr. Taimur Khan (Sarangi-waaley. ), Khurram Waqar (guitarist of Knumb: knumb.com) and Omar Pervaiz (vocalist/guitarist of the Naqsh Band: naqsh.info). My earliest association with music dates back to 1985, when I was selected to be part of the school’s morning prayer troupe, which lead an assembly of over 500 students in reciting the serenely beautiful poem by the poet of the East, Dr. Allama Mohammad Iqbal, Lab Pe Aati Hai Dua Ban Ke Tamanna Meree. Over the years, my musical taste has gravitated towards North Indian Classical Music and I have been learning vocals from a number of Ustads/gurus who include some of the best musicians in Pakistan. I had the opportunity of formally becoming a student of Mubarik Ali Khan, a renowned sarangi player of Pakistan who passed away in December 2002. Mubarik Ali was a student of Jhandey Khan and Bade Ghulam Ali Khan, and was also an excellent vocalist with a large repertoire of bandishes. I then had the opportunity of learning from Mehfooz Khokhar, the extraordinary vocalist and scholar of Sangeet, who is the student of Ustad Abdul Qadir Piyarang. In addition, I feel that I have benefited greatly from my brief interaction with Allah Rakha Khan (the last of the sarangiyas in Pakistan), Nazar Hussain (composer/vocalist extraordinaire/sarod player) and finally the master of Gawalior gaiki, Ghulam Hassan Shaggan. I formally became a student of Ustad Shaggan in 2006. In conclusion, while continuing with my studentship of sangeet, I remain ever so thankful to my parents for allowing me the opportunity to pursue music, and to my wife Sharmeen for her support in my on going quest. Lastly, I would like to thank my daughter Lyla and my son Zaid for being my biggest fans and their continued appreciation of my music.